Most teachers use more than one instructional strategy depending on the science subject matter, their students, and the available resources. Therefore, a single drawing cannot capture the complex nature of teaching and learning. However, drawings do highlight what is of importance to a teacher. 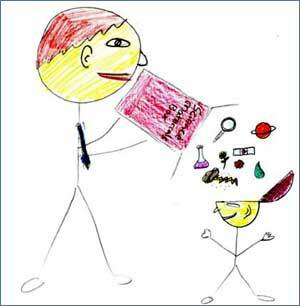 What does the drawing on the left suggest about the teacher candidate's image of science teaching?